There's no birthday party like a Kardashian family birthday party! As the temperatures rose in Southern California Saturday afternoon, Kim Kardashian and Kourtney Kardashian decided to throw a joint-birthday party for their children North West and Penelope Disick. Let's just say the mermaid-themed celebration turned out to be oh-so-magical. As documented on Snapchat, the birthday girls dressed in matching mermaid outfits while Kim opted for the same costume as one of her emojis. Khloe Kardashian decided to wear lavender hair by her niece's request while Kylie Jenner was focused on showcasing the "Under the Sea" elements outside including a display from Balloon Celebrations. "This is how Scott and I spend our Saturdays," Khloe joked on Snapchat before enjoying dessert. "Becky with the pink hair." Guests including Kanye West, Malika Haqq and a few familiar Disney Princesses were also able to enjoy dancing and pool time out in the backyard. As for the desserts, E! News can confirm Hansen's Cake in Los Angeles provided the marble cakes with chocolate chip butter-cream filling. Yumm! For those not keeping up with all the birthday celebrations, North turned three on Wednesday and celebrated by traveling to the Disneyland Resort. As for Penelope, she doesn't turn four until July 8 meaning the party is just beginning. "She promised me she wouldn't get any bigger!" Kim wrote on Instagram when wishing her daughter a special day. "I can't believe my baby girl is 3 years old today!!!! Northie I love you so much I can't even explain it! Happy Birthday to my favorite mermaid!!!" 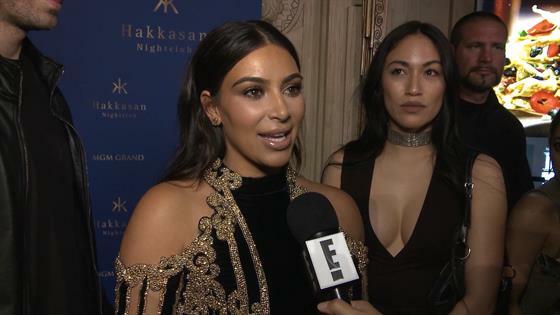 Kim Kardashian Says North West Is in the "Jealous Phase"